Congratulations to River City Art Association member Elise Spaid-Roberts of Terre Haute for having one of her paintings accepted into the 2019 Small Works Exhibit in partnership with The Studios of Key West. 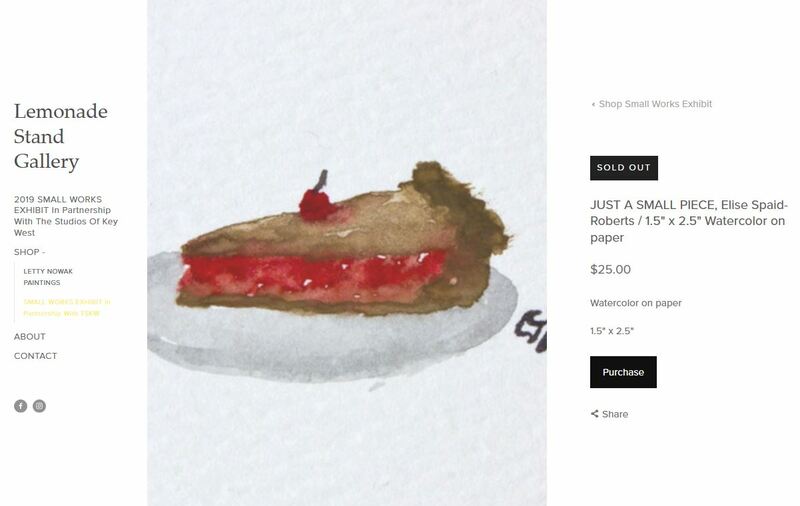 “Just A Small Piece,” a 1.5- by 2.5-inch watercolor on paper of a slice of cherry pie, was chosen for display in the Lemonade Stand Gallery in Key West, Florida, and it sold on opening night! This entry was posted in Member News and tagged cherry pie, Elise Spaid-Roberts, Florida, Key West, Lemonade Stand Gallery, painting, River City Art Association, Small Works Exhibit, Terre Haute, watercolor. Bookmark the permalink.